The ThingsCon report The State of Responsible IoT is an annual collection of essays by experts from the ThingsCon community. With the Riot Report 2018 we want to investigate the current state of responsible IoT. In this report we explore observations, questions, concerns and hopes from practitioners and researchers alike. The authors share the challenges and opportunities they perceive right now for the development of an IoT that serves us all, based on their experiences in the field. The report presents a variety of differing opinions and experiences across the technological, regional, social, philosophical domains the IoT touches upon. You can read all essays as a Medium publication and learn more at thingscon.com. There is a growing appetite for data-intensive and internet-connected technologies, often referred to as Internet of Things (IoT) technologies, to be cast as responsible in terms of how they relate to us as individuals and in terms of their larger role within society. There is a growing discomfort for what could go wrong, and what has gone wrong, with technologies with these capabilities. But what is to be done? There are a few routes to approach framing these technologies as responsible. First is to address how they are regulated, on the level of legislation and policy. The second concerns how they are designed: what exactly are the capabilities that these technologies are designed to have; are the intentions of the designers and entrepreneurs responsible? Relatedly, the third approach considers how people interface or work together with these technologies, and visa versa: how these technologies interface or work together with people; do people make use of the technology in responsible ways; is it possible that the artificial intelligence of the technology develops irresponsible tendencies? While each route is critical to address and opens up very large areas for discussion, this essay is concerned with the ways that these last two routes are entangled with one another. Specifically, how can design support the ways that people understand what these technologies do, and the role that they, as users or consumers, play in helping them do what they were designed to do. How can we step beyond the conventions and expectations of how these technologies are designed to contribute to reframing these technologies as responsible? This essay’s scope targets the relation between design and the users of that technology as pivotal; and likewise turns to challenge design conventions by exploring their alternatives with design itself. This essay will discuss and unpack one particular conceptual design to consider the role that design can have in this effort of framing these technologies as responsible. This design, of an IoT charging station for eclectic cars known as the “Transparent Charging Station,” helps to guide our questioning of where does the responsibility reside when framing IoT technologies as responsible. In this case, it appears to be in how the design makes the work that the technology does insightful for the people using it, as well as the opportunities that people have to act upon that insight. IoT products and services work in ways that are not always apparent to us. Their sleek exteriors (if they even have any) do not reveal the inner workings of these technologies, specifically how they connect, communicate, exchange, and evaluate data within a network of other data-intensive and connected technologies. Conventional design practices favor hiding the complexity that comes with connectivity; and on one hand, this is sensible. It would be overwhelming to be troubled with all the particularities and technicalities of how these technologies work. It would be far easier if the technology functioned the way it was designed to and we as users of these technologies could just enjoy and consume the technology. Technology is intended to make our life easier, more efficient, to limit or overcome barriers. Yet on the other hand, with IoT technologies, we may be unwittingly participating in a network that can take some liberties in terms of our relation with these technologies. For example: a chair that we once merely sit upon could now, as an IoT-enabled chair, detect a change in our weight and start broadcasting to advertisers that we are a prime audience to target diet plans at, resulting in a web browser inundated with ads reflecting the chair’s assessment of how we occupy it. The audacity of that chair! Instead, what if it was apparent how the technology responded to our use, how it connected, communicated, exchanged, and evaluated data within a network of other data-intensive and connected technologies? Instead of being haunted by IoT technologies, where they determine how to engage with us in ways that are invisible and inscrutable, what if we could see the ways that we work with them and how they likewise work with us? In this essay, we turn to the conceptual design of the Transparent Charging Station to provoke the very norms and conventions of design that promote this inscrutable haunting. 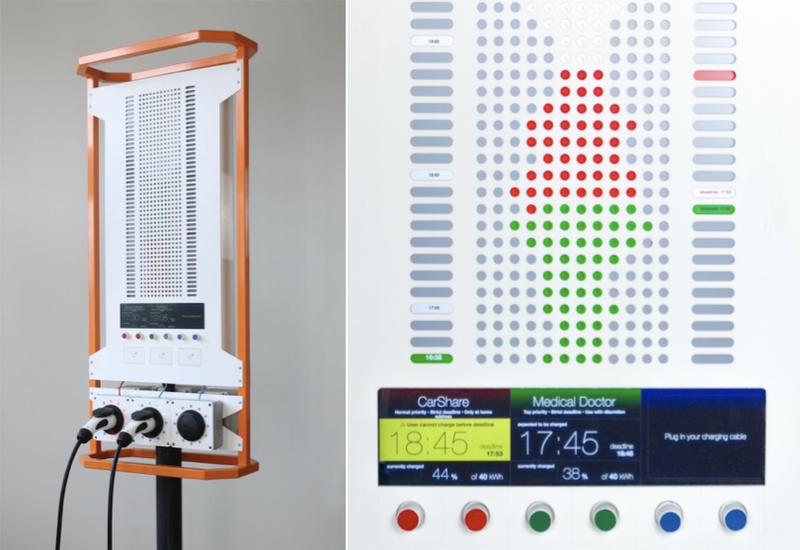 The Transparent Charging Station (TSC), designed by The Incredible Machine, speaks to this very provocation of making the way that people and IoT technologies work together more insightful (see left figure). The TSC addresses one truism of IoT technologies, which is that there is a complex network of other technologies being tapped into to contribute to how the technology works, and that our use of the technology impacts that network’s very functioning. The TSC embraces this truism and is dedicated to making it legible and insightful to the consumer or user of its services, as opposed to the convention to make such operations invisible. Commissioned by a Dutch energy company and sister company specializing in “smart charging” infrastructure (Alliander and Elaad respectively), this IoT electric car charging station offers an alternative to the convention of inscrutable haunting. (Left) The Transparent Charging Station is an electric car charging station that allows people to negotiate how much of their battery is to be charged and within what time period according to the networked constraints of an electric energy grid. (Right) The interface of the Transparent Charging Station demonstrates the constraints and demands on the electric grid with a Tetris-like screen. The figure in the middle illustrate what energy is available on the grid over the course of the day. By turning the dials of your port (red, green, or blue), a driver can negotiate within the constraints of what is available on the grid, and the demands other patrons are making of that station. Design and images: The Incredible Machine. The TCS is a speculative design developed in anticipation of the widespread prevalence of electric cars. The reality behind the infrastructure of electric charging will radically challenge existing practices and expectations surrounding how we fuel cars. Car batteries require more time to recharge than it takes to fill a car with petrol at the station. We’ve also grown accustomed to the fact that, under normal circumstances, a petrol station will always have a reservoir of fuel available on demand. However, with an electric fueling infrastructure, the availability of electric energy at the “pump” will fluctuate in response to a number of factors: what is the demand on the electric grid at any particular moment; the availability of renewable resources; the weather; and what’s already currently stored. There are a network of factors that will influence how and when the car can possibly be charged. As a result of the constraints of this electric infrastructure, namely the fluidity of the resource and the network it relies upon, there are two significant design hurdles. First how to prioritize fueling protocols. The system will not be able to accommodate the influx of cars being charged after rush hour, and therefore decisions will have to be made about how to prioritize requests. The second design challenge considers how to conceptualize and make insightful to users the fluctuating availability and networked qualities behind this charging station and resource. To address these particular design challenges, the TSC features a design and interaction where people can negotiate with the algorithms behind the charging infrastructure. In their interaction, people determine how much of their battery needs to be filled and within what timeframe. How, or even if, these requests will be fulfilled will vary based upon how the request impacts the other the constraints posed by the other nodes in the network. For example, a request for a full battery charge within an hour may not be possible if there is a high demand on the system on a cloudy day. Perhaps if there was more solar energy being contributed to the grid that day it may be able to accommodate that request. Each station has three ports from which energy is dispensed for three different vehicles. To communicate how the fluidity of the resource is impacted by our energy demand, the charging station features a large interface that resembles a Tetris game (figure on right). This interface contains an outline of an irregular shape that represents the boundaries of what is available from the electric grid at that particular charging station, and what it predicts to be available over time. Within that outline there are colored blocks that represent the request being made from the other ports of that station. The person who has come to charge their car has two dials which they can rotate to indicate how much charge they will need (15%, 85%, 100%, etc.) and within what time frame (1 hour, 8 hours, 24 hours, etc.). The board will modify the Tetris-like configuration in accordance with these requests as they relate to what’s available to that station and what are the demands of the others currently utilizing that station. The demand I make on one of the station’s ports will impact that of the other user who is also charging from that station. If I ask for a full and rapid charge from the station, it will draw energy from the other car’s charging arrangement. In this dynamic interactional exchange that one has with the station, we negotiate with the algorithmic constraints that govern this system, as well as with the network itself as a whole. The TCS makes the dynamic among the energy grid, the station, and the person insightful. It does so by making explicit what factors are taking into account by the charging algorithm, and making experiential how they affect the projected distribution of resources. In this case, the TCS looks at the available energy and the stress (amount of energy needed before deadline) of each of the patrons, and their privilege (some car owners require a full charge at all times, such as emergency responders). The ability to play with the parameters empowers citizen to scrutinize the algorithm and be better informed about how they are being treated, as well as to decide how they want to navigate the system itself. The TCS has been well received at various industry and research venues. Recently it was even awarded the very prestigious Dutch Design Award under the product category. These accolades attest to the fact that this design offers us a very plausible future for IoT technologies. So plausible in fact that even a city is exploring how to deploy this conceptual design within their municipality. The station provides us with a lens to address the question: from what position should we frame the responsibility to reside within the IoT? This essay opened by proposing that there are three routes to addressing this: legislatively, in design, and in the exchanges between people and the technology. The scope of this essay sought to examine how can design support the ways that people understand what IoT technologies do, and the role that they, as users or consumers, play in helping them do what they were designed to do. With the TSC we find that responsibility is framed in terms of making the way the technology works “transparent,” and in the opportunities that people have to be autonomous agents within this system. The TCS makes an interaction out of something that was formally made invisible, to make it insightful for the people using it. Algorithms tend to be designed and trained to promote predefined optimal outcomes. In this case, we find that the TCS does not address the intention behind the algorithm, but the design language proposed by TCS could be used to make the difference in different intentions transparent to the people using the technology. With this design, responsibility is being framed in terms of having available for scrutiny how our interactions with, and demands of, the technology draw on and likewise impact the network behind it. It isn’t just a question of making these particularities of the technology available for scrutiny, but in a form that is insightful for people to be able to be able to develop a perspective on. Further, this insight and perspective can be put to use with the opportunities that are made possible for the user to exercise their autonomy and agency, such as with negotiating the charging request with the station. We also find some nuance with the TCS regarding how the concept of “transparency” relates to responsibility. Insight into the dynamics of the station aren’t literal or explicit. If the station was explicit about all the work it was doing and the connections it was making, it would likely be difficult for the layperson to process and make sense of. This would hinder our ability to decipher and scrutinize the technology. The TCS cannot be the perfect or complete solution for all our questions regarding how to create a culture of responsible IoT technologies; but this design does offer us some direction in provoking potentially problematic design conventions. We can develop a vocabulary through examples such as the TCS to advance our agenda of responsible IoT design. Let us remember, this particular project started as a conceptual design, was then recognized as a product, and will potentially be implemented in a municipality. This is a radical trajectory for a conceptual design. There are more questions that the TCS will surface the more it is developed and made use of, but they are likely to be exactly the questions we need to be asking at this time. Part of what makes the TCS so special is its acknowledgment of what about the infrastructure of electric energy is unique. Rather than attempting to create a design or system that assimilates those qualities into design convention (of hiding the complexity), these qualities are explored to consider what opportunities lie within them to frame them as more responsible. We need more work to follow this suit. 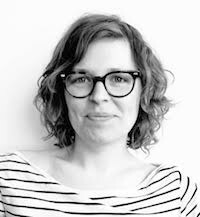 Holly Robbins is a postdoc at Delft University of Technology (Netherlands) where her research is in values and ethics of technology. She focuses on internet-connected and data-intensive technologies. She is also a co-author of the IoT Manifesto and a co-founding board member of the Just Things Foundation. This text is licensed under Creative Commons (attribution/non-commercial/share-alike: CC BY-NC-SA). Images are provided by the author and used with permission. Please reference the author’s or the authors’ name(s). Full disclosure: Marcel Schouwenaar and Harm van Beek are both partners in The Incredible Machine as well as co-founders and board members of the Just Things Foundation.